If you enjoy the taste of fresh basil in your favorite recipes and would like to have a fresh supply of basil on hand whenever you cook, you should learn to grow this herb indoors. The good news is that basil is easy to grow from seeds to a healthy plant that provides fresh herbs whenever you need them. Basil originated in India. 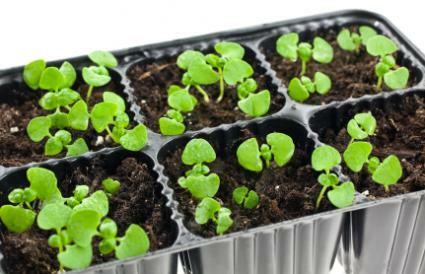 Basil seeds need a warm, stable temperature to germinate, therefore the best place to germinate basil seeds is indoors. Fill small terra-cotta pots or seedling trays (if you plan to transplant the seedlings outdoors) with quality, nutrient rich, potting soil. Add no more than five to six basil seeds to each pot or two to three seeds in each seedling tray cell. Lightly cover the seeds with organic compost. Use a squirt bottle to gently mist the soil so that it becomes damp. Do not over saturate. Cover the pots or trays with plastic wrap to help retain moisture and humidity. Place the pots or trays in a warm, well lit room. The seedlings should begin to emerge within seven to fourteen days. Promptly remove the plastic wrap as soon as you observe the young plants emerging. Once your seedlings are two to three weeks old, they are ready to be transplanted if the weather is warm and you would like to grow them in your garden. 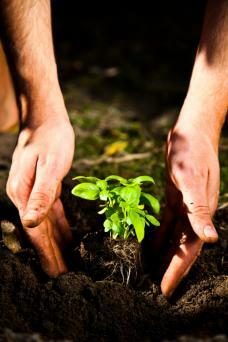 Make sure to pick a warm, sunny location in your garden to transplant the seedlings. Using a trowel, dig holes deep enough to accommodate the seedling's root system, plus the soil in each cell. You can loosen the soil in each seedling cell by gently going around the perimeter with a knife, however, be careful not to damage the roots. Place the stem of the seedling between your thumb and index finger and gently work the seedling loose, tipping the tray if necessary. Once it is out, carefully place the seedling into the hole and gently fill in any gaps with extra soil. After the seedling is firmly planted, water the plant with a watering can. When your basil plants are three to four inches tall, pinch off the very top leaves, which will cause the plant to produce lateral shoots. This will help the plant to grow bushy. When you see flowers starting to grow, pinch them off immediately because they will hinder or stop new leaves from growing and can also alter the flavor of the existing leaves, making them bitter. Only allow basil plants to flower if you are trying to produce seeds for future generations. Check the pH of the soil every four to six weeks and maintain healthy pH levels with an organic fertilizer. 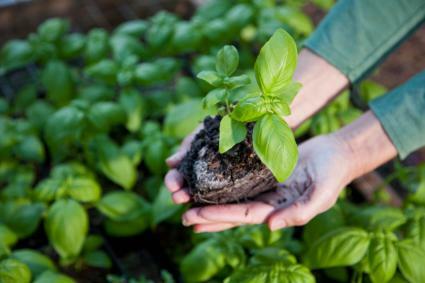 When growing basil in containers, you can prevent compost and some nutrients from leaching out of the soil by placing a tea bag over the hole in the bottom of the pot, which will act as a filter, allowing mainly water to pass through. Whenever you need fresh basil for a recipe, simply pinch off a few leaves and throw them in with whatever you are cooking. Remove the leaves before serving. 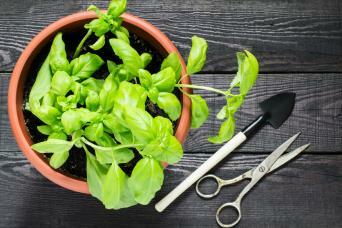 After you have successfully grown your own fresh basil, you may want to expand into growing other types of herbs. Once you have discovered your green thumb, your kitchen windowsill could easily be transformed into your own indoor herb garden!